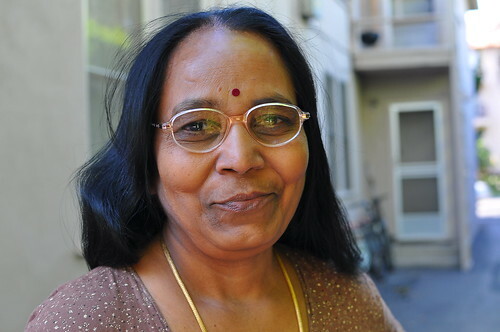 Last spring, a wonderful woman named Renuka moved into the apartment across from mine. She and her husband arrived from Madras, India to spend six months with their son Raga, a graduate student at Caltech. The moment Renuka stepped into her temporary home on East Del Mar Boulevard, she whipped out the pots, pans, and spices that she had carried with her from India, fired up the stove, and began cooking non-stop. Raga had been without proper home cooked meals for over a year, and as his coddling mother, she felt compelled to remedy the situation immediately. Before I met Renuka face to face, I was seduced by the smells emanating from her kitchen. 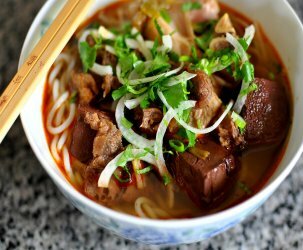 Whenever I stepped into the hallway that our apartments shared, I was smacked in the face by an intoxicating blend of chilies and spices. It was torturous to say the least. I remember the first time I met Renuka vividly. It was early afternoon and I was preparing to grill a pork tenderloin. As I was carrying the meat from my apartment to the barbecue set up in the back lot, I noticed Renuka peeking her head out from her kitchen. I said hello and explained to her that I was working on a pork-intensive food photography project. She made a bit of a funny face and told me she was vegetarian. While holding the bloody hunk of pork in my hands, I tried my best to convince her that my regular diet was mostly meat-free. I’m not sure she believed me. From that day forward, we spent time together on a regular basis. At first it was just hellos and how are yous, but it eventually evolved into a solid friendship—I’d never had such a lovely neighbor. 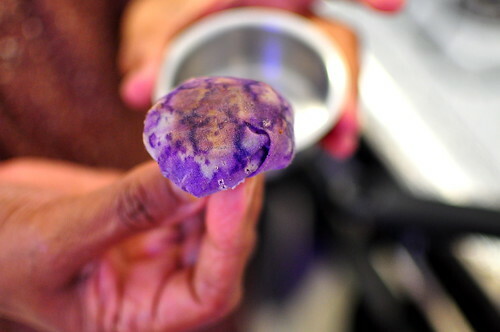 The first time Renuka invited me into her kitchen, she prepared one of her specialties. 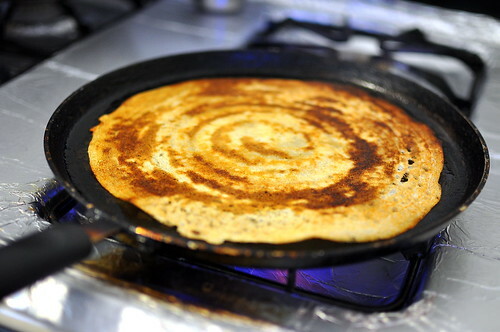 Dosa, a typical dish in South Indian cuisine, is a thin and crispy fermented crepe made from rice flour and lentils. 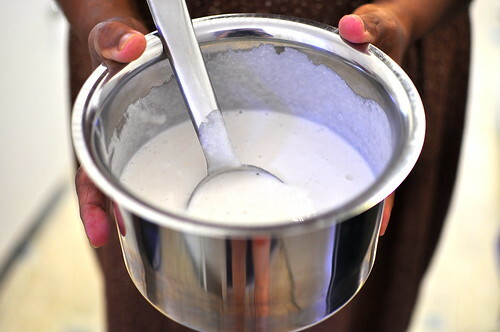 I was hoping to witness the entire process from start to finish, but Renuka had already prepared the batter and the accompanying chutney by the time I arrived. 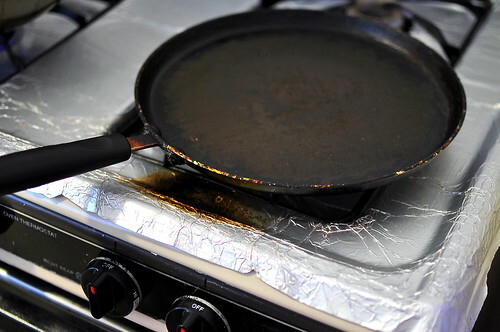 All that was left to do was a little frying on the stove. While Renuka set everything in place, I rummaged through her cupboards checking out the raw ingredients. 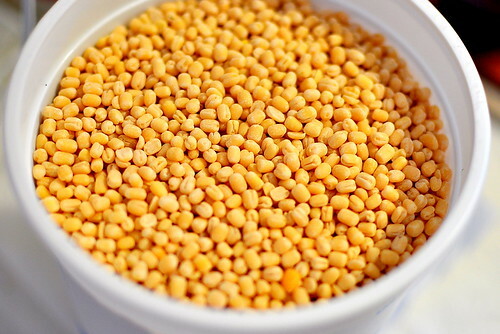 These little lentils went into making the dosa batter. …then she poured the batter onto the hot and oiled pan, and using the back of her ladle, she distributed the batter evenly across its surface. A brief moment later, the dosa was slightly browned in the center and crisped around the edges, which meant it was ready to be flipped! 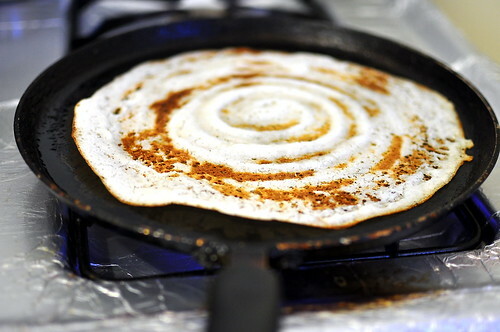 Another quick fry on the scorching surface and the dosa was primed to be plated and eaten. 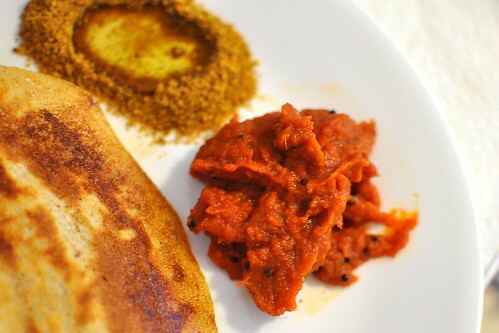 Renuka served the dosa with an intensely spicy tomato chutney, as well as a milder “dosa powder” with sesame oil. She insisted that I sit down and eat the crepe while it was still nice and hot. I asked her to join me at the table, but that’s not how things are done in her culture. 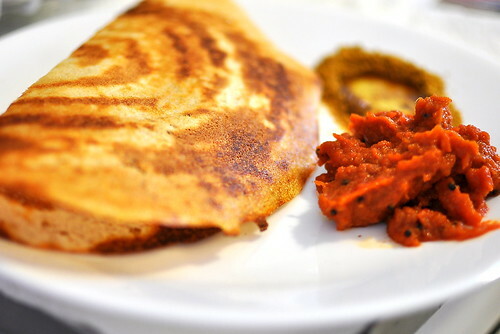 Of course, the dosa was totally perfect and the chutney was fiery like no other. I tucked away three of them this afternoon, not to mention two uttapams for good measure. Even when I had reached my limit, Renuka kept piling more food onto my plate. When I truly couldn’t eat another bite, she shook her head and called me a “poor eater.” Now, that’s a first! Renuka is back in India now, and we have plans to reunite when she returns to Pasadena in a few years to watch Raga collect his Ph.D. Until then, visions of piping hot dosas and gut burning chutneys dance in my head. I hope to be a “good eater” when she feeds me next. 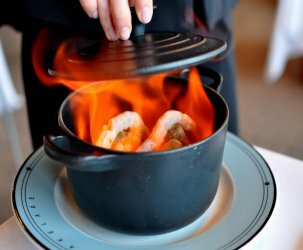 That was a great read – lovely story about your temporary neighbor and the cooking bond. Makes me crave a warm dosa. Oh! I would love that have such a lovely neighbour! Her refusing to sit down and eat with you reminds me of my mom when she makes banh xeo! awww, what a sweet story cathy! 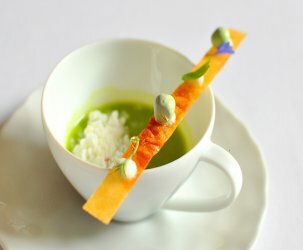 would you be able to replicate this? What a great story. Who wouldn’t want to be a neighbor to you. Have a great New Year! What a fun post 🙂 Maybe I should go around my apartment building and see if I have some interesting neighbors! How lovely that your neighbours are friendly! We don’t really have that here in London. 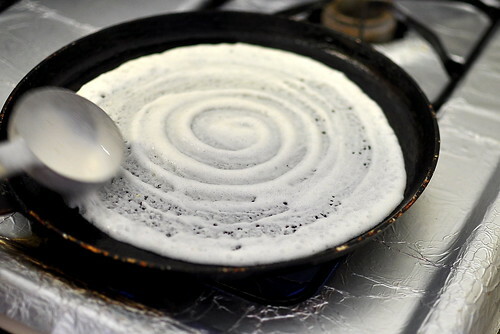 I’m very curious about that dosa powder…. Su-Lin – Neighborly love isn’t very common in the U.S. either, at least in the cities I’ve lived. However, when there’s homemade Indian food on the line, everything changes 😉 The dosa powder had a great texture and flavor, mostly I appreciated how it didn’t make my gut burn. Thanks for sharing a personal story. This is one of my favorite gas•tron•o•my posts. mmmm I can’t imagine anything better than that. So cool that she even brought her pans!